Two 1-1/4" x 2-1/2" tweeters Offer crisp high frequencies. XStat CLS high-frequency electrostatic transducer Offers a dynamic listening experience. 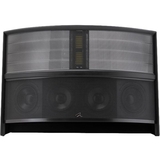 3-way speaker system Sounds like 1 source rather than several separate sources. Binding post Offers simple, secure connectivity. 45Hz - 23kHz frequency response Ensures a wide range of accurately reproduced sound. 90dB sensitivity Ensures crisp, robust audio. 6 ohms nominal impedance Ensures efficient conduction of power through the speaker.